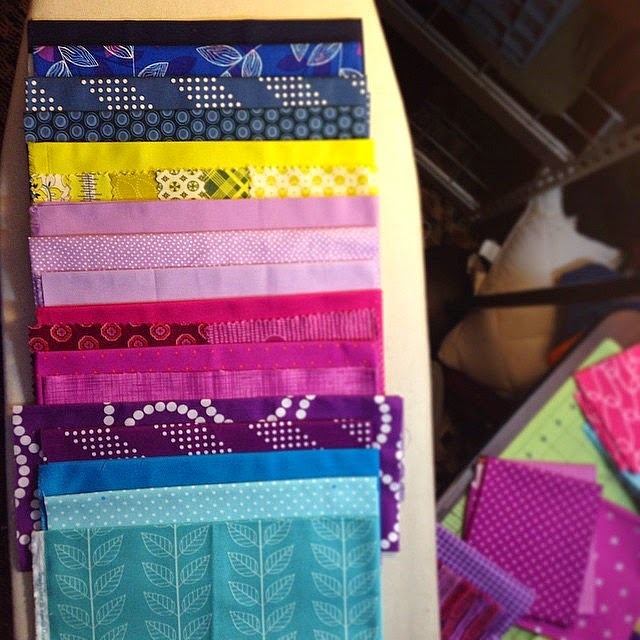 Have you met Kim from Ties that Bind Quilting? She is one of the participants in our Round Trip Quilts adventure. Read more about that here and here. Most of the time you can find Kim on Instagram and Flickr. Straight out of the package. Instead of going with a theme for her quilt Kim decided that her colorway would be her theme to tie all of our additions together. Both Heather and Liz did an amazing job adding to Kim's quilt top so I knew that my addition had to be equally fabulous. I liked option 1 best. I liked the weight that the center diamonds gave the block. However, I put the question to Kim to find out which she preferred. I'm glad I did. She liked option 2 better. I still wasn't sold. So I let it sit for a few more days and came back to it. I'm glad I did. 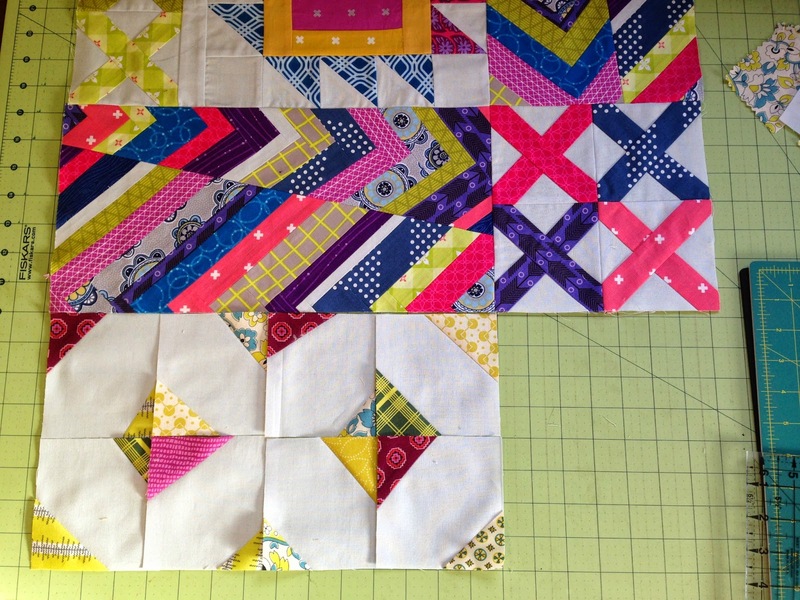 When I was playing with the pieced trying to decide which way I wanted the option 2 "butterfly centers" to face I stumbled upon a third option I hadn't though of before. Wonky, crazy, flying geese! 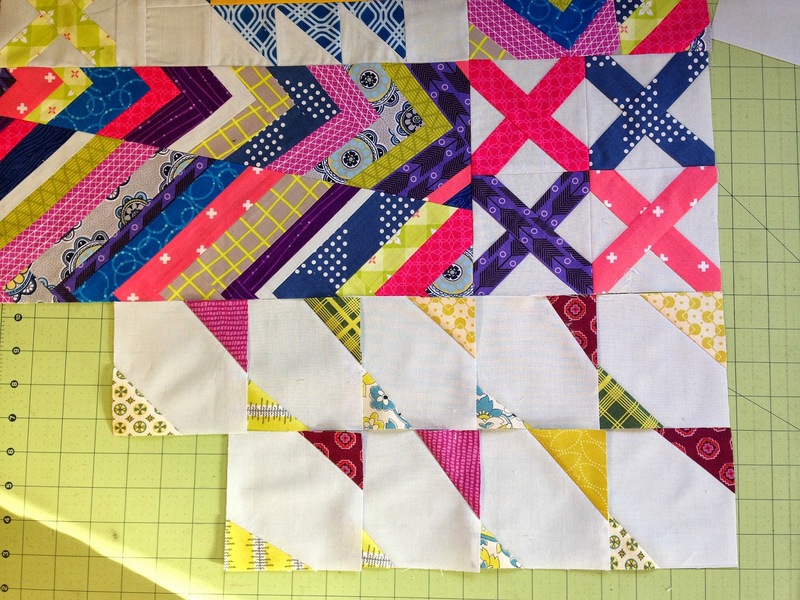 I started with the blocks/colors mis-matched but then realized that I could match them up to make the geese more prominent in the design... and I LOVE IT! I really like how what I did still creates movement in the top and I think the geese still reflect some of the weight that I liked about my first option. I hope that Kim agrees. I'm still playing with possibly trying to attach what Heather added to the top with the addition of some more of my crazy geese, but I'm not totally sold on it yet. I still have 7 days to decided before our mailing deadline. This one is heading to Canada to stay with Leanne for a few weeks next. Quilt top after my addition. Looks crooked but it's because the ground is sloped. The other nice surprise is that when I was making the base squares for my design I sewed a quick 1/4 inch seam on the other side of the piece I was cutting off and saved them. They make the cutest little half-square triangles. The biggest one is only 1 1/2 inches across. I'd like to keep them and make a fun little mini quilt to hang at work with the first one I made out of extra blocks from Heather's quilt (which I just realized I didn't blog about, time to fix that!) I like the idea of having a little gallery of minis inspired by and created out of the pieces that I'm added to these quilts. It would be a fun way to remember each project. 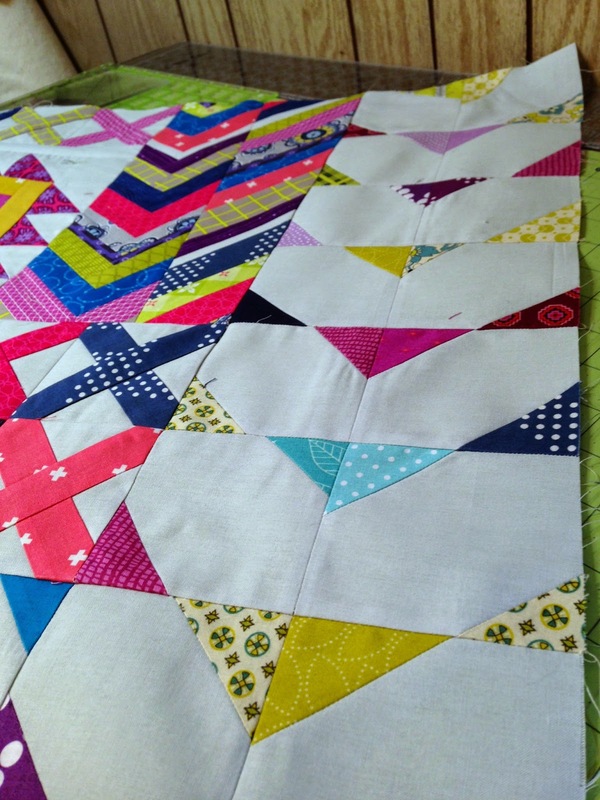 I'm linking up with Fabric Tuesday at Quilt Story for the first time. I like your nice bright colors! I think it's a great idea to have a little something to remember your participation in this adventure! I love the wonky flying geese. It does give it great movement. Oh, option #3 is just right! 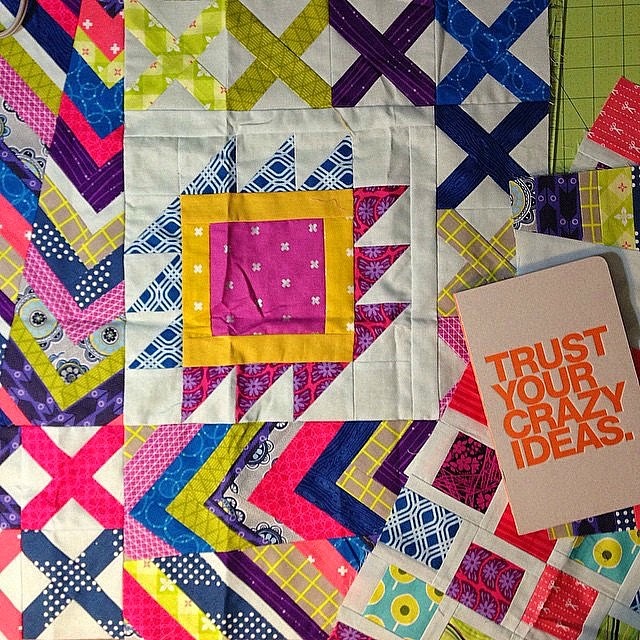 I love the idea of having scraps left over from these turning into inspiration and memory mini quilts. You made the right choice there - looks great! 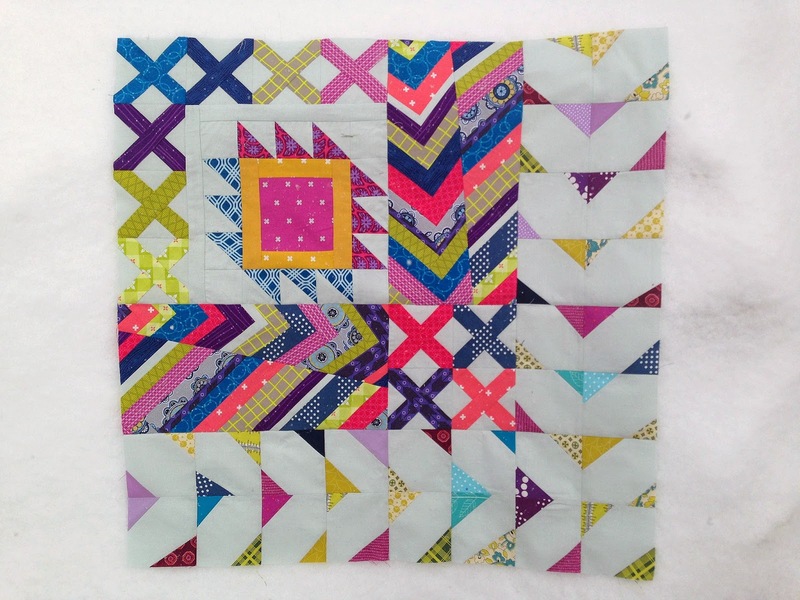 such a bright quilt! I love your addition to it, it flows so nicely! I think Kim's plan is working; the colour choices are tying all the elements together. 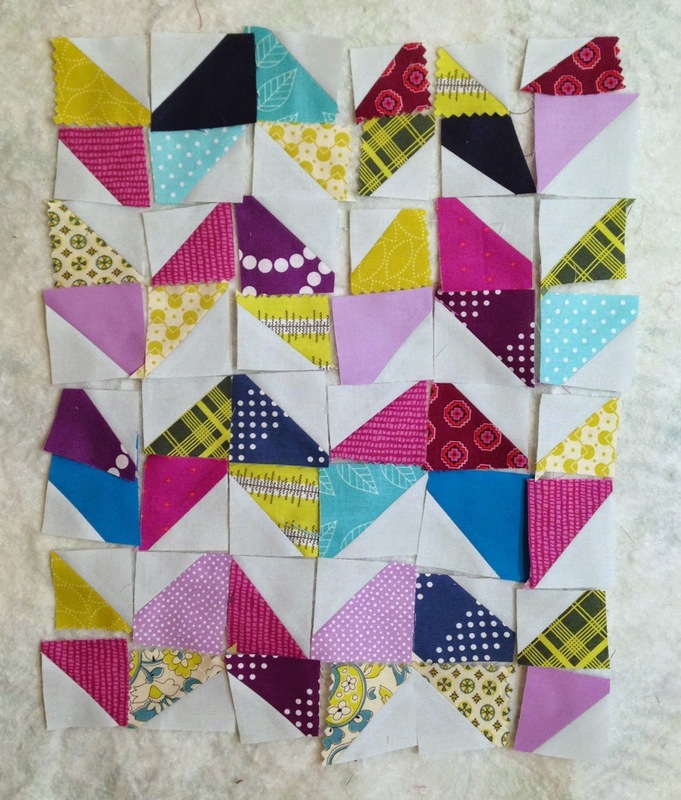 The third option was inspired, and I think the mini quilt will be adorable. I know I commented on IG but I totally missed your blog post! I love your third option and props for listening to the notebook! :) So excited about how this is coming together so far!